Call before Our Cleaning Angels will call you 20-30 minutes ahead of arrival (if keys are not provided). Checklist We follow our “furnished home 35 Point” OR “empty home 23 Point” Checklists plus any Special Requests you selected during initial booking. Supplies We bring all supplies. First Time Walk Through Our Team Representative will conduct an Opening & End Walk Through with you. We will take a few minutes to review your Work Order. We can adjust your service estimate should your property specifications be disproportianate to your Work Order upon arrival. Heavy Lifting If you require us to clean behind a fridge, shelf or heavy furniture, please pull it out for us in advance, because we don’t want to scratch your floor (and reduce injury). Dishes A reminder we don’t put away dishes, because we don’t want to stack things in a way that you would not (and to reduce risk of breakage). Linens If you requested Special Request “bed linens changed,” please leave the clean sheets ON each designated bed. Walls Entire washing of walls / floors by hand must be approved as a Special Request during phone/email booking. 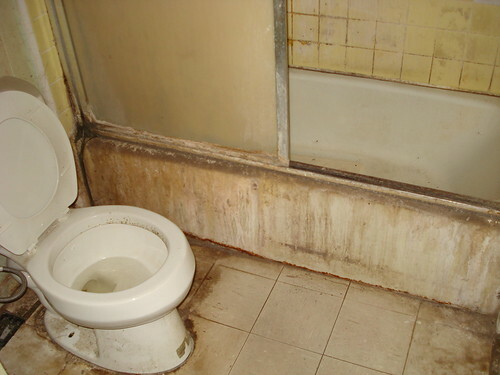 Safety and Hazards No cleaning of mould, grime, pests, soot, or severe conditions is included. Reasonable Cleaning Condition We hold the right to reject your job should the Opening Walk Through show utter lack of maintenance such as this sample photo. We do charge 100% of the service for our time. Can I go out? Feel free to run your errands during cleaning. If it’s your first time, just ask your Team Representative to call you back in time for your End Walk-Through. Call before Our technician will call you 20-40 minutes ahead of arrival. Supplies We furnish all equipment and supplies. Should you have special request to use organic, eco-friendly products, please request so during the initial booking. Heavy Lifting If you require us to clean behind the bed, shelf or heavy furniture, please pull it out for us in advance, because we don’t want to scratch your furniture (and reduce injury). First Time Walk Through Our technician will conduct an Opening & End Walk Through with you. We will take a few minutes to review your Work Order. We can adjust your service estimate should your property specifications be disproportianate to your Work Order upon arrival. Elevator Access For apartment carpet / upholstery cleaning 2nd floor or above, we come on the condition that the elevator is working. Carrying our 80lb machine up stairs can cause injury. Can I go out? Feel free to run your errands during cleaning. Just ask your technician to call you back in time for your End Walk-Through. Thank you for agreeing to our complete Terms of Service during initial booking. We extremely appreciate you for notifying us 2 business days in advance should you wish to cancel or reschedule as we hate to charge cancellation fees. Simply email [email protected] or call 604-475-5683 during business hours Mon – Fri, 9am – 4pm.